Transparent Aluminum Armor Provides More Protection Than Bulletproof Glass! The term “transparent aluminum” has been tossed around for some time now, but no one has ever really come close to creating a viable product. While the United States Navy is working diligently to develop a new bulletproof material called Spinel, Surmet Corportation is already commercially producing its own version called ALON®. ALON, which was developed by Raytheon and is technically known as aluminum oxynitride, is optically clear aluminum capable of providing bulletproof protection. ALON begins as a powder, before it is molded and baked in extremely high heat in order to liquefy and cool the powder quickly. From there, it is a crystalline structure with very high strength and scratch resistance comparable to sapphire. It gets its clear look from the aluminum oxynitride being polished, which further increases the material’s strength. 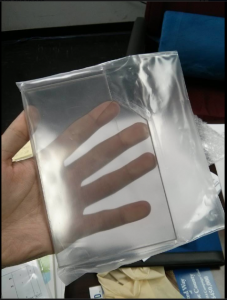 Transparent aluminum armor is comprised of three layers: an outer layer of aluminum oxynitride, a middle layer of glass and a rear layer of polymer backing. Not only can optically clear aluminum armor deflect the same rounds from weapons as traditional bulletproof glass, aluminum armor can stop a .50-caliber armor-piercing bullet in half the distance. Not to mention, transparent aluminum armor is half the weight and thickness of traditional bulletproof glass! While transparent aluminum armor can be produced in basically any shape and is more durable than bulletproof glass, it costs three to five times more. For now, you can find it in smaller applications such as the lenses in battlefield cameras, but don’t be surprised if the unique aluminum armor starts popping up in larger applications in the near future.